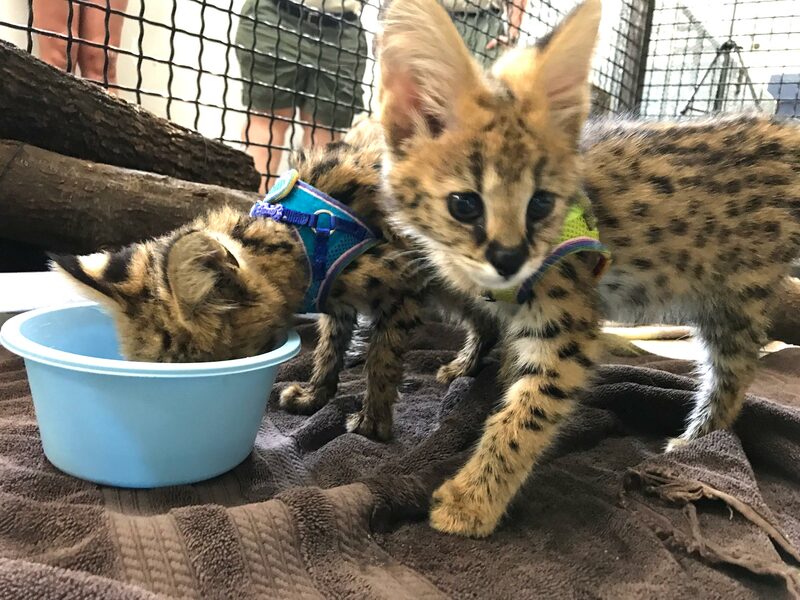 Four baby servals, two baby caracals and one hybrid Savannah cat truly learned the meaning of independence over the Fourth of July when they were seized from a Buffalo, New York, residence in a carefully executed rescue mission. The gorgeous young cats were rescued by the Department of Environmental Conservation (DEC) and the World Animal Protection organization. All but the Savannah were kittens, between the ages of 2 and 6 months old, and were suffering from malnutrition and mistreatment. They were being kept by an exotic animal trader who allegedly intended to sell them, illegally, as pets. 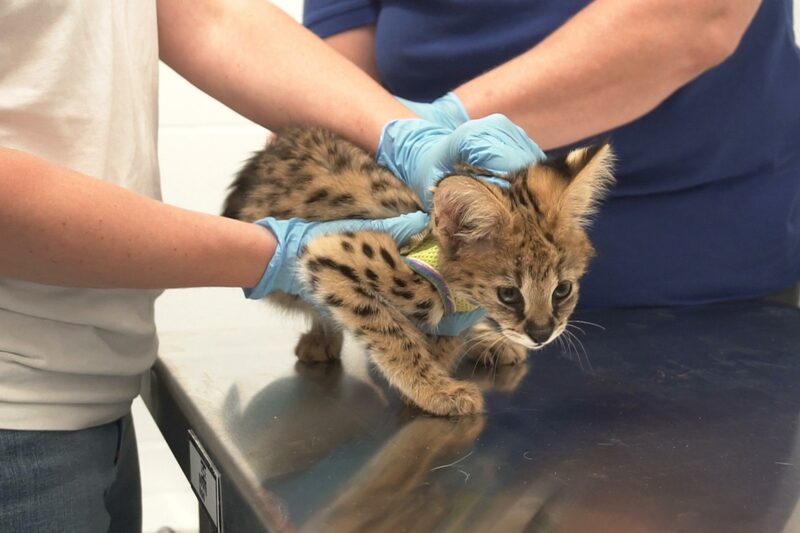 One serval kitten, named Sammy, was near death and needed immediate subcutaneous fluids to survive. Fortunately, the operation was thoroughly planned during the week leading up to the cats’ seizure in order to guarantee both the safety of the animals and the heroic human team. The at-risk wild cats were removed from the home on the morning of July 5 by the DEC, World Animal Protection and sanctuary staff. They were given emergency veterinary care, then safely transported to two different sanctuaries, Safe Haven Wildlife Sanctuary in Nevada and Turpentine Creek Wildlife Refuge in Arkansas. The rescued felines will now permanently reside in these protective and vastly more suitable environments. 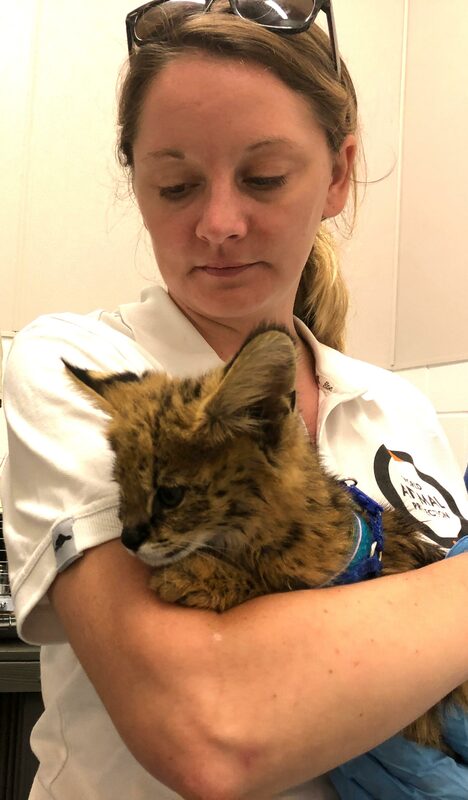 World Animal Protection U.S.’s Exotic Pets Campaign Manager, Kelly Donithan, was on the premises for the cats’ seizure, as well as during the veterinary exams, and traveled with the animals to their new sanctuary homes. The Savannah cat was inhumanely declawed, a procedure which may result in long-term physical problems for the feline. “World Animal Protection was glad we could do this emergency rescue to bring attention to the plight of exotic pets and their mistreatment in the U.S. These cats were suffering from severe malnutrition and near death due to the ignorance of the person that was holding them, allegedly intending to profit from their sale,” said Alesia Soltanpanah, Executive Director, World Animal Protection U.S.
“These young wild cats are prolific hunters and can jump up to 20 feet in the air. Removing them from their natural environment and subjecting them to a life as a domestic pet is cruel and dangerous. Their size and natural instincts create a hazardous situation for those who encounter them, especially small animals and children,” Soltanpanah continued. 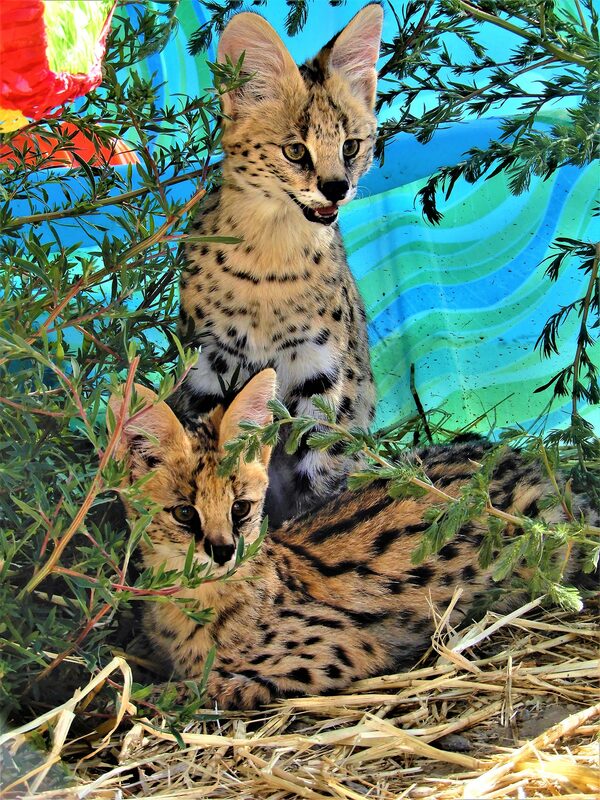 According to World Animal Protection, the beautiful, spotted serval is native to Africa and can grow up to 40 lbs. Their hearing is quite sensitive, allowing them to expertly hunt small mammals in the grass. Servals are able to leap vertically to catch birds in the air and have amazing hunting success rate, catching prey nearly 50 percent of the time. They are mainly solitary, and crepuscular, meaning they hunt at night or in the early morning. 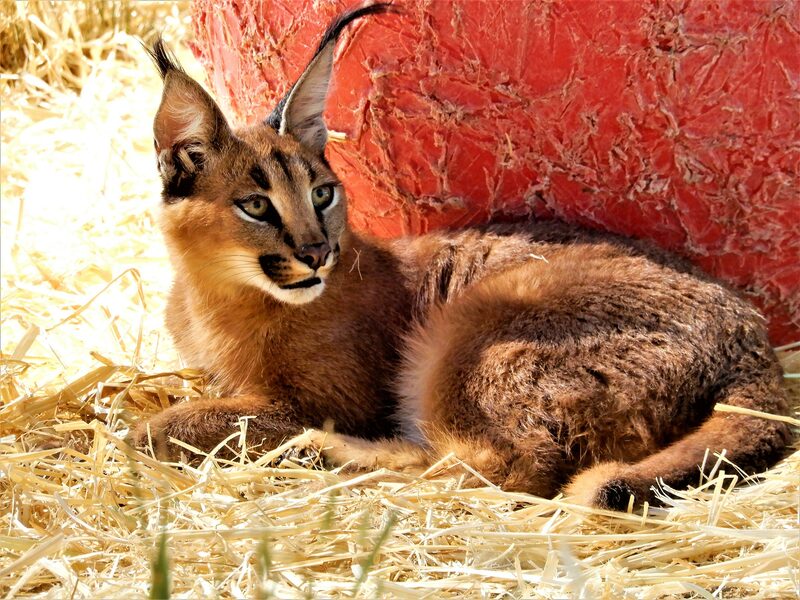 Similarly, the caracal (the cat with the unique tufts of fur on its ears) is a medium-sized wild cat native to Africa, the Middle East, Central Asia and India. They, too, can weigh up to 40 lbs. Caracals are the largest member of Africa’s small cats, and they prey on a variety of mammals, including rodents, rabbits and small antelope. Like servals, they’re also known to leap high in the air to grab birds and are primarily night hunters and solitary animals, except during mating season. 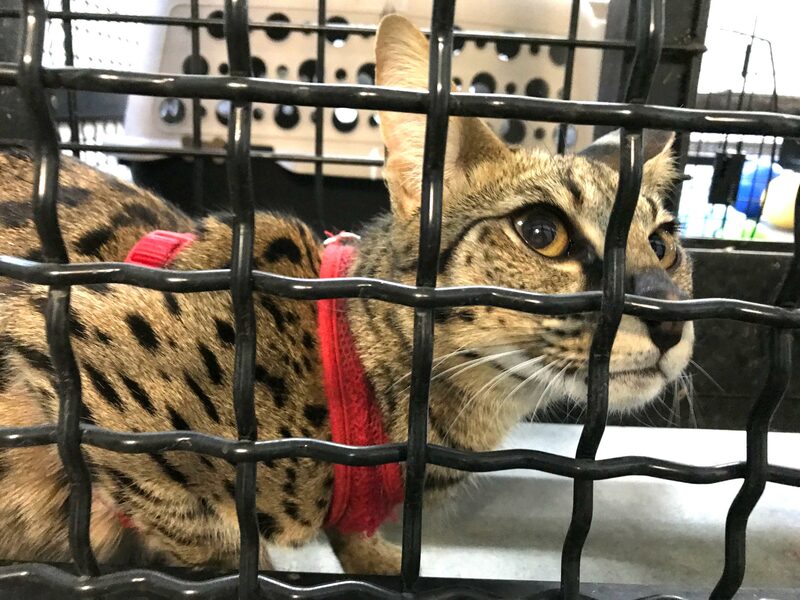 Finally, the Savannah is an exotic (and very expensive) hybrid resulting from the cross breeding of a serval and a domestic cat. Although exotic pet laws and regulations vary by state, servals and caracals are both illegal to possess and sell as pets in New York. “The possession, sale, barter, transfer, exchange, and import of wild animals as pets is strictly prohibited in New York under NYS Environmental Conservation Law 11-0512. Each year, millions of animals are poached or farmed and sold into the exotic pet trade. Whether the trade is legal or illegal, these animals suffer terribly,” reads a news post on the World Animal Protection website. World Animal Protection believes that life as an “exotic pet” limits wild animals’ natural behavior and makes them at-risk, both physically and psychologically. When deprived of proper shelter, food, space to roam free and without proper regulation of their body temperature, these animals become deprived and inherently suffer in captivity.